When I first arrived in Philly, I planned to make my bike my main mode of transportation. But as the temperature dips so does my resolve. 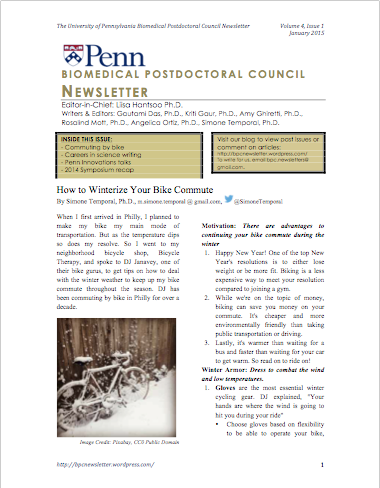 So I went to my neighborhood bicycle shop, Bicycle Therapy, and spoke to DJ Janavey, one of their bike gurus, to get tips on how to deal with the winter weather to keep up my bike commute throughout the season. DJ has been commuting by bike in Philly for over a decade. Happy New Year! One of the top New Year’s resolutions is to either lose weight or be more fit. Biking is a less expensive way to meet your resolution compared to joining a gym. While we’re on the topic of money, biking can save you money on your commute. It’s cheaper and more environmentally friendly than taking public transportation or driving. Lastly, it’s warmer than waiting for a bus and faster than waiting for your car to get warm. So read on to ride on! Winter Armor: Dress to combat the wind and low temperatures. Choose gloves based on flexibility to be able to operate your bike, especially to brake. Five-finger gloves offer the most flexibility while fewer finger gloves, like mittens, provide more warmth. DJ uses two pairs of five-finger gloves to adjust for the temperature. He wears liner gloves for Fall-like temperatures & layers them with thicker, waterproof gloves when the temperature drops. Jacket with wind resistance is best. “The wind will cut through your clothing despite the many layers.” It’s not necessary to shell out money for a cycling jacket if you only commute occasionally. In addition to wind and water-resistance properties, cycling jackets are designed to be longer in the back to cover the rear and avoid unintentional mooning while you ride. Head cover can be a simple beanie or a thin cycling hat to wear as a liner under your helmet. It’s not necessary to buy a winter helmet, which is usually just a regular helmet with a matching liner. Socks in wool are best for the same reason as baselayers – breathability and warmth. Eye wear is the least essential buy though they can help protect your eyes during inclement weather. DJ wears clear woodshop safety glasses that he got for $7 at Home Depot. A great alternative to $100 and above sports glasses such as Oakleys. Place the arms of your glasses under your helmet straps to avoid your glasses from shifting when your helmet moves. Wear brighter colors and/or reflective fabrics to remain visible with the shortened daylight. For the guys, DJ recommends the Levi Commuter Jeans, which he is wearing in the pictures, or Cadence, a biking lifestyle brand because it has reinforced crotch and pockets to avoid paying for your commute with your jeans. For the gals, Ali Carr Troxell in her “Outsider Magazine” article recommends the Outlier Women’s Daily Riding Pant because it offers stretch, breathability, warmth and – wait for it! – water resistance! Your Ride & equipment: The following are slight adjustments to your ride for the winter. Inflate your tires 5 to 10 pounds less pressure to increase your traction on the road. If possible, change your tires to the widest possible width to further increase your traction. Snow tires are a splurge item since it doesn’t snow often enough in Philly to warrant them. Buy locks with cylinder covers to prevent them from getting wet, freezing and rusting. Occasionally, spray your locks with WD-40 to further prevent rusting. Buy front and backlights to increase your visibility. Occasionally, clean your tires with a simple wipe to remove salt, which can eat the rubber of your tires. Occasionally, clean your brake pad to remove dirt and glass and ensure optimal braking power, which is essential during inclement weather when the road is wet and slippery. Don’t over lubricate your drive train (chains) or do it less often with a thinner lubricant during the winter. “If it’s wet or over lubricated, your chain will pick up more dirt…a thinner weight lubricant won’t hold on to as much dirt” explained DJ. Wash your bike in March to remove the accumulated winter gunk and in September to prepare it for the upcoming winter. Bike lanes may be more slippery since salt and debris get swept by the wind and collect in this area. Be cautious of trolley tracks. Snow can hide tracks and further narrow an already limited road. Potholes! If you find yourself unable to avoid one, DJ advises to “slow down, if possible and travel with it. Slack out your knees and elbows to absorb more impact. Don’t tense up” to decrease possible injuries. Overall, maintaining your bike commute in Philly doesn’t cost nor require a lot of special equipment. Fortunately or unfortunately, depending on your perspective, the most essential one isn’t bought – motivation. 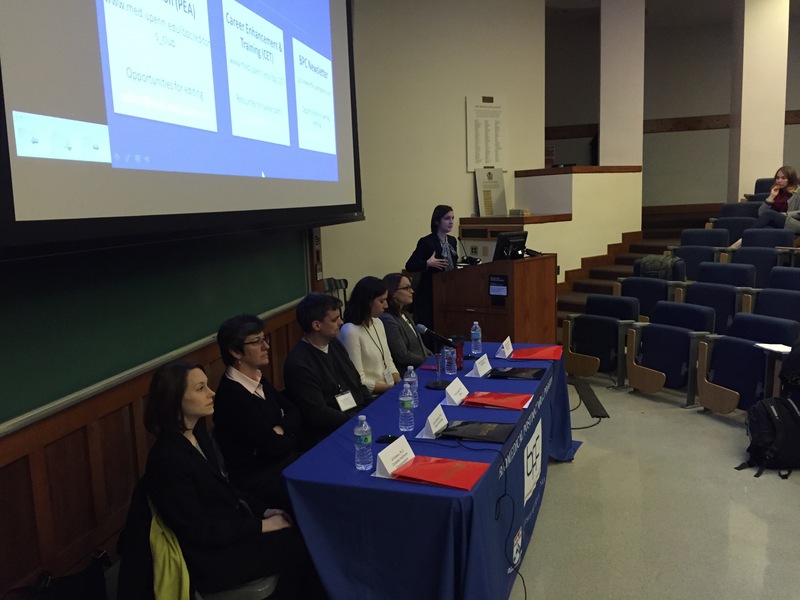 Panelists discussed a variety of careers for PhDs in science writing and communication. Image Credit: Daphne Avgousti. 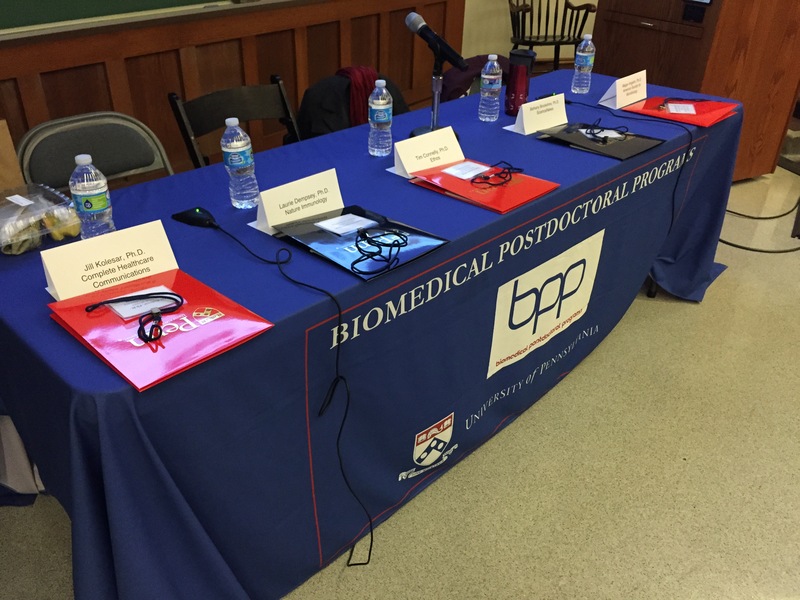 The Biomedical Postdoctoral Council (BPC) wrapped up an eventful 2014 with a panel on careers in science writing, editing and communication. 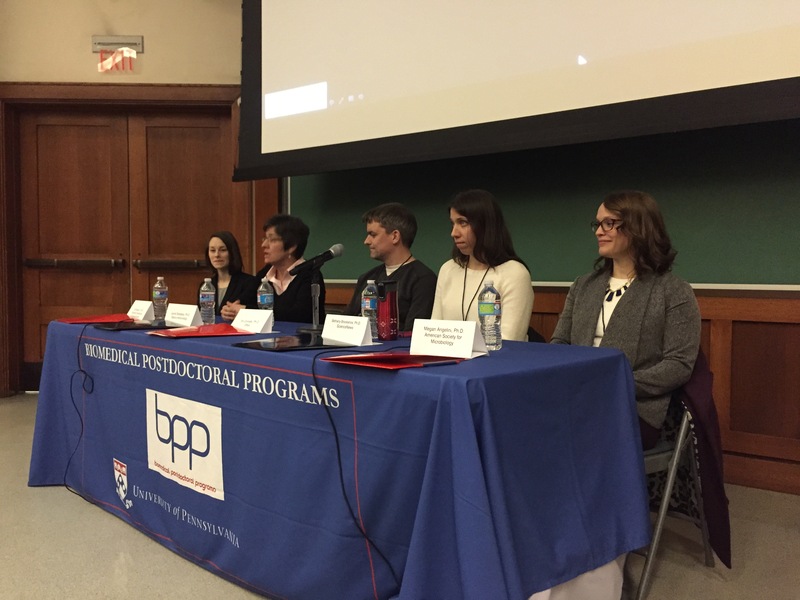 The panel, a joint effort between BPC’s Career Enhancement and Training Committee (CET), the Postdoctoral Editors Association (PEA) and the BPC Newsletter, included writers and editors from a variety of publications. Panelists were Megan Angelini, Ph.D. (Editorial Acquisitions Specialist, American Society for Microbiology), Bethany Brookshire, Ph.D. (Science Writer, ScienceNews; @SciCurious), Tim Connelly, Ph.D. (Medical Writer, Ethos Health Communications), Laurie Dempsey, Ph.D. (Senior Editor, Nature Immunology), and Jill Kolesar, Ph.D. (Medical Writer, Complete Healthcare Communications). The panel began with each panelist describing his or her career path. While all panelists had doctorates in the biosciences, some knew earlier on in their academic training that they were interested in a career outside of the lab. 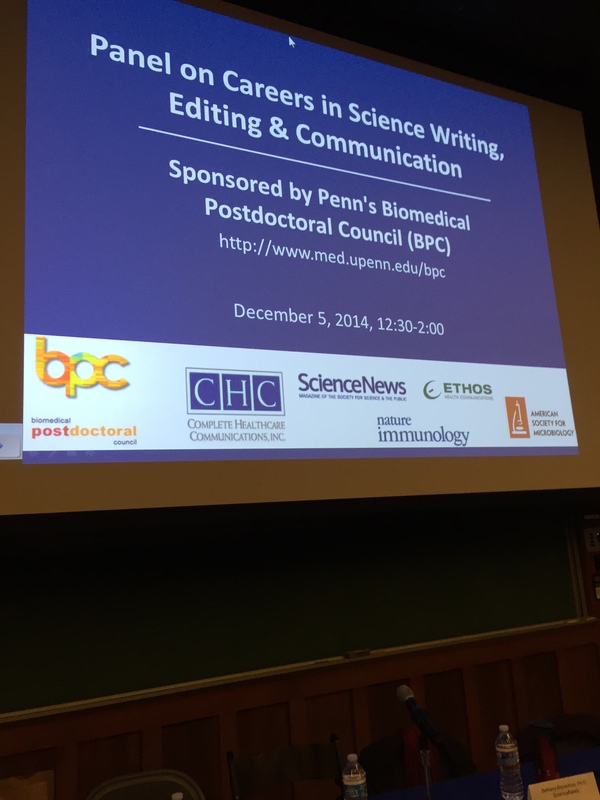 In order to gain experience in science communication, many of the panelists started small – editing manuscripts for other lab members during graduate school, organizing journal clubs, starting a science blog, freelancing, or writing and editing for groups such as the PEA or BPC Newsletter. All of the panelists expressed a passion not just for science, but also for communicating it to others. Once they had discovered their enthusiasm for communicating about science, they went to stake out their career paths. To transition into science communications, the panelists employed a range of tactics, from informational interviews and networking at conferences to making formal job applications. In discussing their current positions, the panelists outlined a range of duties. Kolesar emphasized that in her position, the focus is looking at data, and being able to synthesize and communicate it in a condensed, clear way. Brookshire stressed reliability, mentioning that being able to consistently produce engaging and cutting edge writing is key in her position. Dempsey related how her broad background in the sciences has been beneficial in her role as a Senior Editor, as she is able to evaluate articles across a range of topics. Each panelist reflected on the variety of knowledge and duties involved in their positions, and that defining a “typical” day is difficult. The panelists all emphasized that if you’re interested in science communications, start exploring now. They mentioned an array of resources for getting started, including science writing certificate programs and fellowships, books such as The Science Writers Handbook (1) or Brookshire’s upcoming Complete Guide to Science Blogging (2), and participating in writing and editing opportunities within your own university. 1) Hayden, T. & Nijhuis, M. (eds). (2013). The Science Writers’ Handbook: Everything You Need to Know to Pitch, Publish, and Prosper in the Digital Age. Boston, MA: Da Capo Press. Halloween afternoon witnessed an exciting event to celebrate the innovative works of our University at Penn’s South Bank, a hub built on 23 acres of land for innovative research and new business ventures. The event kicked off with “Pennovation Talks”- four brief, dynamic presentations by innovators at Penn who are shaping the future of science, technology, medicine and society. In her talk “Adding touch feedback to robotic surgery,” Dr. Katherine Kuchenbecker, Associate Professor at the School of Engineering and Applied Science, showed how her team has given robots the sensation of touch to perform surgery. Surgeons using robot-guided surgery can now feel the patient’s organs they are operating on. Additionally, every contact the robot makes inside the body can be seen as a graphical representation. What’s more interesting is that these add on features only cost $300 and $10, respectively! Previously, surgeons could not feel the patient’s internal organs during a robotic operation, and were unable to get graphical feedback of the procedure. This new technique is already showing promise — interns who practiced with robots having these additional features performed better on the actual surgery the next day. When surveyed on whether they would like to have either of these features, all 83 surgeons and interns responded unequivocally: both add-ons! Prof. A.T. Charlie Johnson, School of Arts and Sciences, shared his research on making an artificial “nose” using nano sensors in cancer detection. Since dogs have a 1,000-10,000 times higher sense of smell than humans, they are now being trained at the Penn Vet Working Dog Center to detect blood and other tissue samples of cancer patients. If they are capable of smelling out the specific compound in these cancer tissues, sensors will be developed to pick up the same odorant. Prof. Karl Ulrich, Wharton School, talked on “How important is the raw idea in innovation?”. According to him if one wants to know whether an idea can be a success or not, a survey of as few as 4 potential consumers will give the same result as consulting 7 professionals. So consumers are better judges than the professionals! 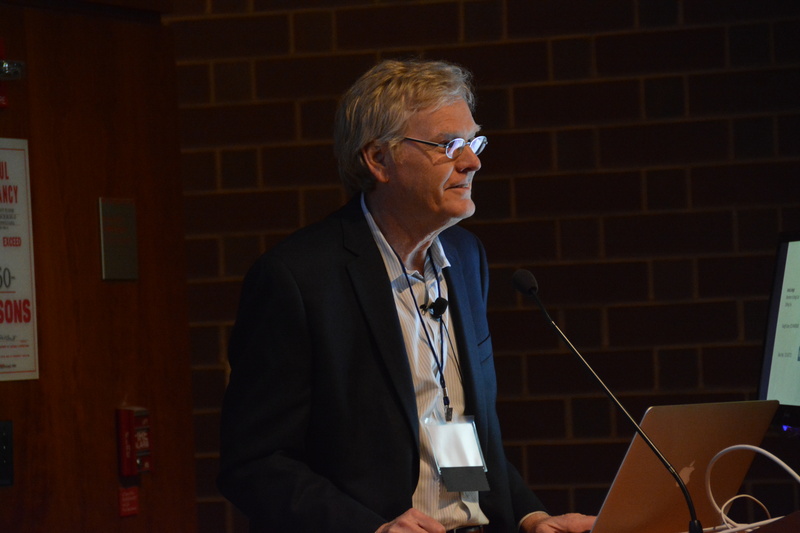 Prof. John Trojanowski, Perelman School of Medicine, presented “Is Alzheimer’s Disease infection like mad cow disease?” where he addressed a key question in the propagation of tau aggregation. Tau protein forms aggregates in the brain of Alzheimer’s disease patients. His work showed that mice injected with synthetic preformed tau fibrils can produce neurofibrillary tangle-like inclusions and these can propagate from the site of injection to other connecting areas of the brain. In a way these synthetic tau fibrils are infectious in nature, spreading the tangles to unaffected regions of the brain (1). Following the talks, President Amy Gutmann had a conversation with special guest Walter Isaacson, author of the new book “The Innovators: How a Group of Hackers, Geniuses, and Geeks Created the Digital Revolution” (2). 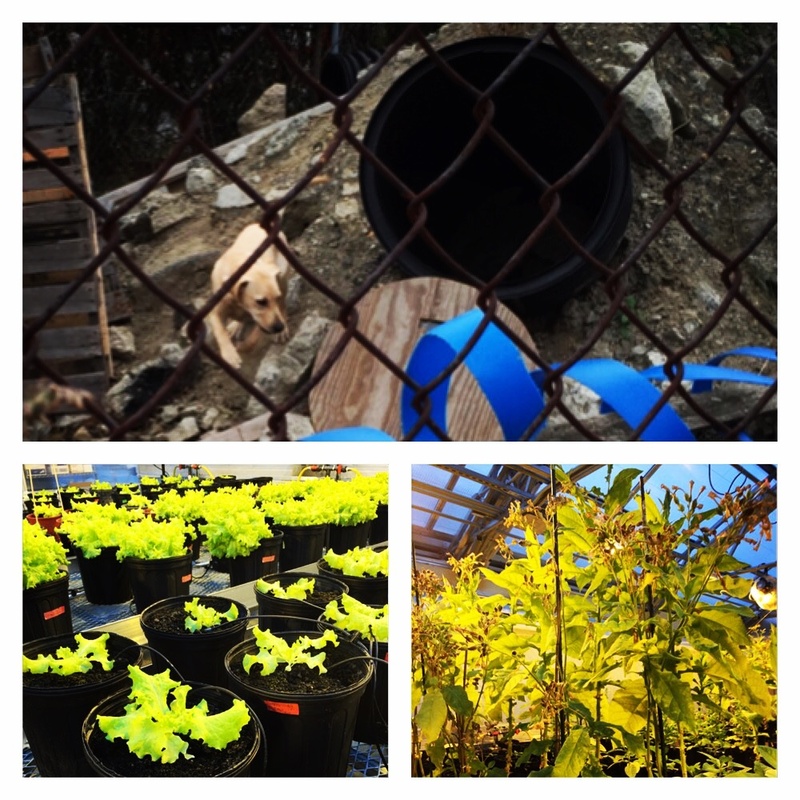 In addition, an optional “Behind The Scenes South Bank Tour” was organized to let visitors have a look at the Penn Vet Working Dog Center and Penn Dental Greenhouse. There were also demonstrations by KMel Robotics, a company founded in 2011 by two Penn graduates. At the Penn Vet Working Dog Center there is a training program for puppies to develop them into well-rounded, social, driven dogs capable of excellent detection work viz. search and rescue, explosive-, narcotic-, diabetic-alert and cancer detection using positive training methods and incorporating real world scenarios. The visitors had the opportunity to see a 4 month and two 18 month old puppies showing their excellent detection skills. In the beginning all the puppies are trained for agility, obedience, fitness and conditioning. Depending on their likes and dislikes, these dogs are trained for specific jobs. All these dogs in the training center have a foster parent and go back home with them in the evening just like kids do. According to Executive Director Dr. Cindy Otto, who established this center, their success relies on teamwork. In the Penn Dental Greenhouse, Prof. Henry Daniell of Penn Dental Medicine is growing and harvesting genetically engineered plants that produce therapeutic proteins. With a vision to provide medicine at a low cost to everyone, he has turned commonly consumed and easily grown lettuce leaves into drug delivery systems by packaging the powdered plant material into capsules that can be delivered orally. Cellulose in plants cannot be digested by enzymes produced in the human body but can be easily degraded by the gut microbes. This allows the therapeutic proteins produced by the lettuce leaves to reach the intestine where they can be absorbed. The capsules can be stored at room temperature for up to 3 years compared to many vaccines and drugs that need to be refrigerated and have a short shelf life. This reduces the cost to a considerable extent. Currently, plants in the greenhouse are producing drugs for diabetes (3,4), hemophilia-A (5), Alzheimer’s disease and retinopathy, and oral vaccines for polio, cholera, malaria, tuberculosis, anthrax and plague. If all goes well, these promising drugs will go into clinical trials in two to three years. Overall it was an afternoon that highlighted the wide array of innovative research and work that is being done within our Penn campus. Iba M, Guo JL, McBride JD, Zhang B, Trojanowski JQ, Lee VM.Synthetic tau fibrils mediate transmission of neurofibrillary tangles in a transgenic mouse model of Alzheimer’s-like tauopathy. J Neurosci. (2013) 33(3): 1024-37. Isaacson, W. The Innovators: How a Group of Hackers, Geniuses, and Geeks Created the Digital Revolution. (2014). Simon & Schuster, New York, NY. Boyhan D, Daniell H. Low-cost production of proinsulin in tobacco and lettuce chloroplasts for injectable or oral delivery of functional insulin and C-peptide. Plant Biotechnol J. (2011) 9(5): 585-98. Kwon KC, Nityanandam R, New JS, Daniell H. Oral delivery of bioencapsulated exendin-4 expressed in chloroplasts lowers blood glucose level in mice and stimulates insulin secretion in beta-TC6 cells. Plant Biotechnol J. (2013) 11(1): 77-86. Verma D, Moghimi B, LoDuca PA, Singh HD, Hoffman BE, Herzog RW, Daniell H. Oral delivery of bioencapsulated coagulation factor IX prevents inhibitor formation and fatal anaphylaxis in hemophilia B mice. Proc Natl Acad Sci U S A. (2010) 107(15): 7101-6. Information compiled by Tom Beebee, Ph.D.
Postdoctoral researchers discuss their work at the annual Symposium. Image credit: Hoora Shagahi. 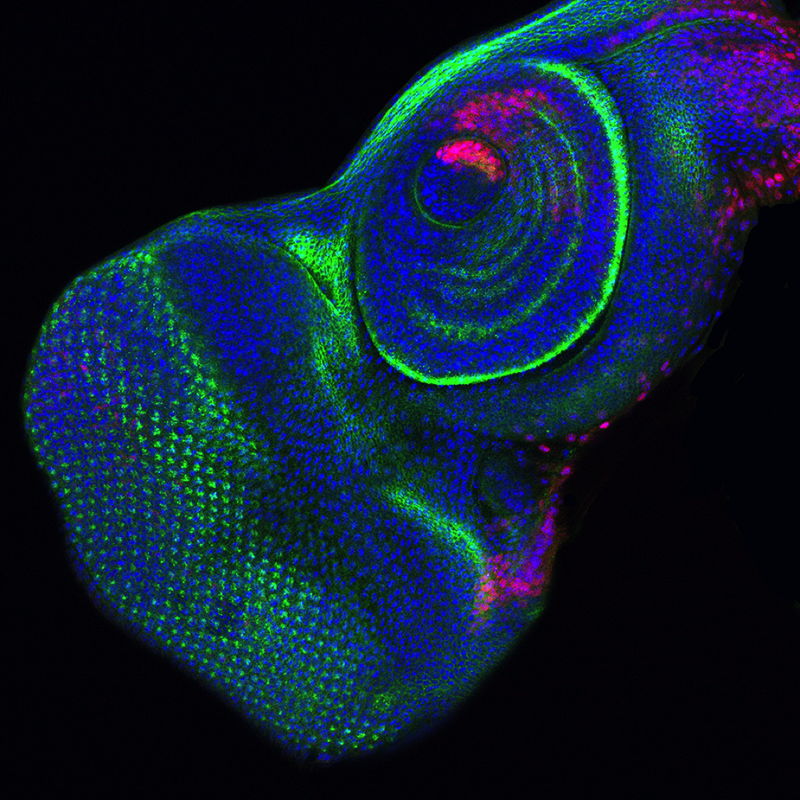 This year’s winning image and unofficial mascot for the Symposium – (“A larval third instar eye/antennae disc of the fruit fly D. melanogaster.” Image Credit: Jessica Talamas Ph.D.
Postdoctoral fellows enjoy lunch with keynote speaker Michael Young, Ph.D.
Kumar Memorial Postdoctoral Lecture Award – Matthew Kayser, M.D., Ph.D.
AUM LifeTech Science & Innovation Award for best Oral Presentation – Kurt Marsden Ph.D.
AUM LifeTech Science & Innovation Award for best Poster Presentation – Mariya Sweetwyne Ph.D.
Charles River Laboratories Poster Award – Kristen Long Ph.D.
New England BioLabs Poster Award – Paul Babb Ph.D.
BPC Outstanding Poster Awards – Megan Keiser Ph.D. and Nicole Facompre Ph.D.